Minor shifts in the way you interact with your partner can have a major impact on your relationship. The research of Drs John and Julie Gottman has uncovered some clear patterns of couples who's relationship improved over time compared to those who did not. 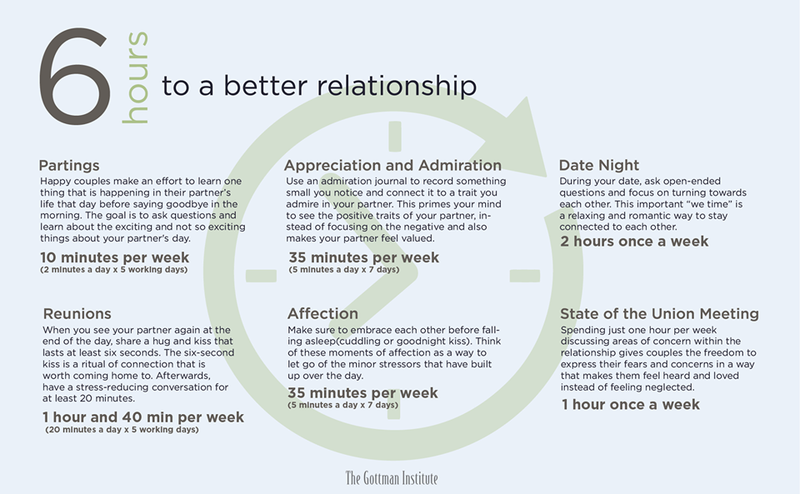 These successful couples simply devoted a few minutes a day to connect with their partner and to maintain a positive relationship. That's it. Not some dramatic relationship overhaul, but rather small efforts throughout the week that took only minutes at a time, accumulating to 6 hours total. Test it out for yourself.